To date, much risk analysis has remained in the domain of specialised and detailed quantitative risk modelling while enterprise risk management has been dominated by qualitative risk assessments. 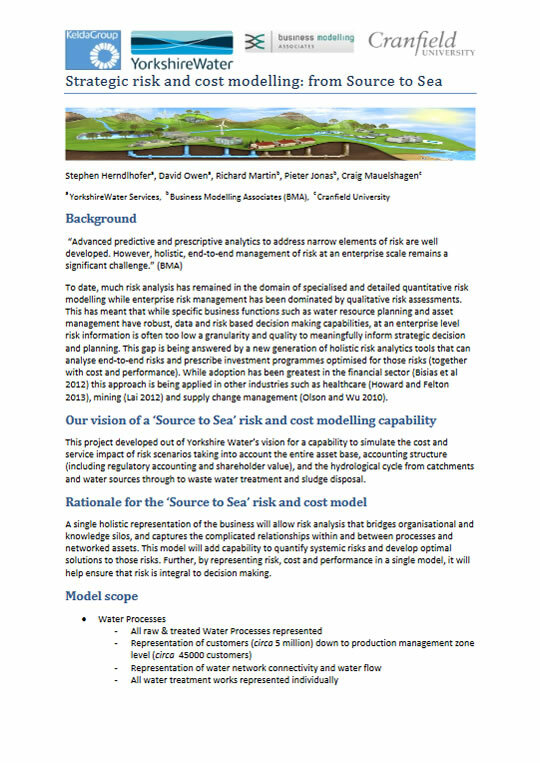 This has meant that while specific business functions such as water resource planning and asset management have robust, data and risk based decision making capabilities, at an enterprise level risk information is often too low a granularity and quality to meaningfully inform strategic decision and planning. This gap is being answered by a new generation of holistic risk analytics tools that can analyse end-to-end risks and prescribe investment programmes optimised for those risks (together with cost and performance). While adoption has been greatest in the financial sector (Bisias et al 2012) this approach is being applied in other industries such as healthcare (Howard and Felton 2013), mining (Lai 2012) and supply change management (Olson and Wu 2010).